Professor Nick Falkner The United Nations predicts that by 2030 one in every three people will be living in cities with at least half-a-million inhabitants. To ensure our cities remain great places to live, work and visit, it’s essential that we get smarter about the way resources and services are managed. The University of Adelaide has taken a lead in this important new field by launching the Australian Smart Cities Consortium. According to Associate Professor Nick Falkner, there are people on University of Adelaide campuses who have the expertise to solve just about any city problem – the key is bringing the people and the problems together. 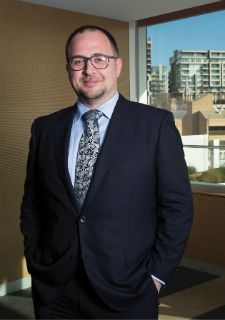 As the University’s Director of the Australian Smart Cities Consortium, Nick is responsible for connecting people from across the University to work with local and state governments, entrepreneurs and industry on smart initiatives to transform Adelaide into a ‘smart city’. He aims to link with people from all University faculties, from technologists, scientists, economists and social scientists to demographers, legal experts, designers and students. Their brief will be to deliver smart city solutions, including new products, designs, services and policy to make our cities smarter, safer, healthier and more enjoyable. Nick says while the focus on smart cities is relatively new, analysing and attempting to optimise the urban environment has been happening for generations. “People have been analysing what is going on, in terms of living space since the start of civilisation,” he says. “The problem was years ago we didn’t have ways to measure everything we were interested in, or the sensing systems were too intrusive. The ‘smart cities’ approach is a worldwide phenomenon, with projects to manage assets such as transportation, water supply networks, power plants, schools, hospitals and community spaces. The intention is to harness data, technology and public infrastructure to improve the quality of people’s lives. Collecting, analysing and intelligently using data is core to the concept. Sensors are being installed in city infrastructure, from traffic lights to rubbish bins to see how people use infrastructure and public spaces, to keep track of resource use, and find out what people want in their city. Some ‘smarts’ are really obvious, such as lights that come on when they are needed and dim or switch off when they are not to reduce power consumption. Others are less obvious. In Singapore, for example, senior citizens get a card they can tap at traffic light crossings to give them more time to cross the road, making moving around the city safer. Nick says while the University has always delivered solutions to real-world problems, the consortium will bring together people from across the five faculties to work in multi-discipline teams to solve problems. “If I can connect someone in music who is looking at ambient noise to the architecture school, who are working with active electronics, who in turn are working with the computer vision group – just imagine the amazing projects that could come out of that,” he says. Although the consortium was only launched in July, many projects have already been identified. ‘Smart parks’ is one key area of focus, under a new agreement with the City of Prospect as part of the Connected Places project. The work, carried out by members of the consortium, will involve using non-camera based sensors – ensuring there is no personal identification or invasion of privacy – to monitor and analyse how people are using the parks at different times. “For example, sensors could inform us how the play equipment is being used. If one swing stands out as unused, then the council would know that it may need some repair or maintenance,” says Nick. The consortium is also working with Port Adelaide Enfield Council on using ‘smart wayfinding’ as part of its city redevelopment. Smart wayfinding uses virtual signage and other digital technology to help people unfamiliar with an area to find their way around. “We are also building a relationship with Tonsley Innovation Precinct, which is undergoing major redevelopment, and this is a fantastic space for innovation, where Adelaide’s research capabilities can contribute to the community,” says Nick. The start-up period for the consortium has already yielded some great collaborations and Nick is hoping to see an explosion in projects as word travels about the University’s vast expertise in this space. “The more real-world problems we get in, the more problems we can collectively solve,” he says. Alumnus Nick Falkner has been at the University of Adelaide as a staff member since 2007 in the positions of Associate Dean (IT) and Associate Professor in the School of Computer Sciences. Since encountering an early computer in fourth grade at school in 1977, Nick has been fascinated by computers and programing. He has worked as a computer programmer, a winemaker and is an award-winning teacher. His research expertise is in computer science, educational research, network design and development, network security, privacy preservation and the Internet of Things.